Compass Automation has rapidly become an industry-leading provider of material removal automation. In the spring of 2013 Compass completed the project highlighted below for Marathon Special Products, a subsidiary of Regal Beloit Corporation (NYSE: RBC) providing an automated deflashing system. Compass was able to provide Marathon with an outstanding product in a concise timeline. This system met and exceeded customer expectations for part finish and operator ease of use. Marathon Special Products is a manufacturing company engaged in the design and sale of Terminal Blocks and Fuse Holders, which provide interconnection and circuit protection of electrical systems. Marathon has been designing electrical wiring devices for over 50 years. Their facility in Bowling Green, Ohio contains all manufacturing and warehousing operations, including an extensive electrical test lab. The automation Compass provided is for Marathon’s manufacturing of thermoset molded parts, an existing process. In the past, the parts dropped from an injection molding press and were conveyed to operators who were responsible for deflashing the excess plastic. Operators used manual grinding tools to remove flash from the edges and through holes of the parts. The difficulty of deflashing by hand (ergonomics and finish quality), coupled with the required production rate, made it difficult to perform this process manually. The part variety (77 total part numbers) makes automating this process a serious challenge. The operator loads parts into four in-feed fixtures with quick change, adjustable tooling to accommodate all 77 separate part numbers. Once the operator has locked a part into place, the operator presses a touch button. The touch button calls an overhead camera system mounted on a gantry system over to the part where it images the part and determines which part number it is. Once the part number is determined the fixture slides towards the Fanuc robot on a linear gantry. The robot has now called up the correct deflashing program and begins to process the part. After the part is deflashed by the robot the fixture slides back to the operator passing an air knife that blows off debris. The part is unloaded by the operator. Solid Model of the System: Compass fully models all custom-designed systems prior to beginning the build process. Compass will work with the customer throughout this process, utilizing customer feedback to ensure the final system meets the customer's needs. Only after completing a final design review will Compass begin to build the system. Ultimately, the system delivered by Compass made it possible for Marathon Special Products to perform the deflashing. The system keeps up with their presses, provides a consistent finish, and alleviates their operators even from having to select the right part program. 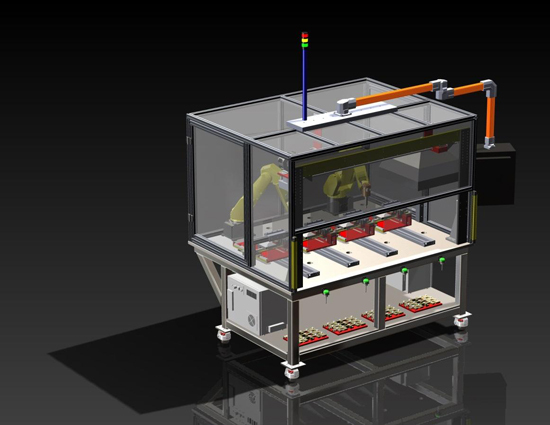 Compass Automation is an Elgin, IL based company that provides customized integration services of industrial robots and automation equipment for manufacturing companies in North America. With the best and brightest engineers on staff, Compass specializes in designing, building and maintaining complex automation systems that optimize manufacturing processes.